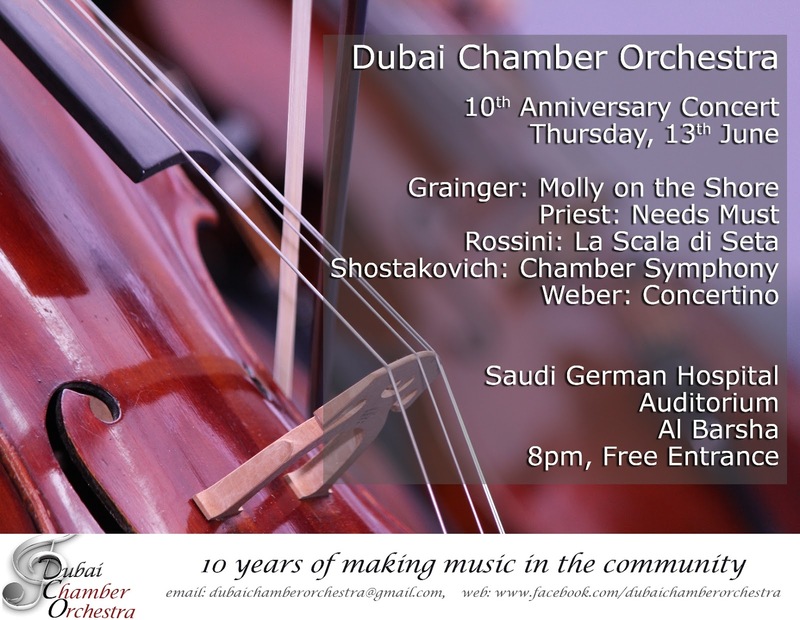 There can't be many of you that are not by now aware that Dubai Chamber Orchestra is playing its 10th anniversary concert tonight at Saudi German Hospital, such has been my fanatical promotion on social media in recent weeks. I hope you will forgive me for the wall to wall coverage, but I am sure you are aware how difficult it can be to attract a 21st century audience, (who, after all, have access to any kind of music they want at a touch of a button, usually free of charge), to come out and see an amateur orchestra play. But, for those of you who do make the trip to Tecom tonight, I promise you it will be worth it. I'm experiencing one of my rare sincere moments today, so, make the most of it, but as amateur orchestras go, DCO is pretty special. It is a group of musicians who turn up weekly to get together and play - that's not so unusual as amateur orchestras go - some of the players make their living from music in one way or another, through teaching combined with playing, while others only took up their instruments recently and played their first live performance with the orchestra, which takes quite a lot of guts. The difference from places where there is a long-established classical music scenes, is that DCO is a "chameleon orchestra" because it is an ensemble that adapts. Under the direction of Barnaby Priest, our conductor, music is chosen depending on the availability of players. This can be difficult due to the transient nature of Dubai, which is a majority ex-pat population, as players leave the Emirate to go home or move on to the next posting. An indication of the turnaround of players is that at present, we have three of the original members who formed the group in 2003 out of a total of around 40 players, and for others, tonight will be their last concert as they are moving on to pastures new. 10 years of continuous music making, playing three concerts per year, is something worth celebrating in these circumstances and that's why we're making a big fuss of our 10th anniversary and have stepped up efforts to bring our music to a new and larger audience. It has certainly been a challenge in some respects, for example, finding a suitable venue that would not charge us an arm and a leg to perform in it, (none of us get paid to play and entrance to our concerts is free so we have to rely on goodwill) but once people started pitching in with company sponsorship of programmes, official photographs, recording, filming, a special 10th birthday surprise, and, an unusual but lovely concert venue, it was clear that all was going to fall into place. Here are a few more of my favourite pictures taken by Carl Wiebe of Katarat Ebda'a at one of our rehearsals. The concert poster with details is at the bottom. Hope to see you there.